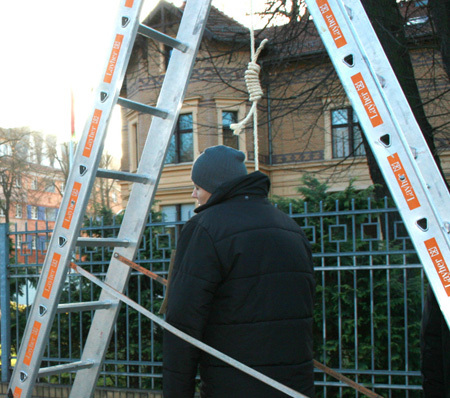 Demand to end the death penalty in Belarus! On November 30, 2011, two young men were sentenced to death after a show trial in Minsk, Belarus. There are no proofs that the two 25-year-old men have been involved in the terrorist attack in a Minsk underground station on April 11, 2011. The trial raised more questions than it could provide answers. An elderly man, whose daughter was a victim of the attacks and severly injured, demanded a fair trial in the courtroom. He subsequently was deported to a psychiatric institution with the help of police forces. A democratic society respects human rights and steps up for those basic rights wherever they do not apply. An independent judiciary is crucial and so is the right for everyone to openly tell if they find something is going wrong. But what to do when these rules are not working? Belarus has international enterprises and banks. Gas and oil transported through the country, travels all the way to the EU. Belarus participates in a globalized market economy in many different ways. Decision makers, whether from the field of politics or economy, do not seem to be disturbed by the absence of democratic elements in Belarus. Concerning human rights and democracy they say: The Belarusian people have to free and overpower dictatorship themselves. The so far missing ‘success’ of the people can only be read that they do not take their mission very serious. Ludmila Kovaljewa, mother of one of the two men awaiting death penalty, reports about the policeman’s reaction to the arrest of her son: “You take care of the rest of your family. You still have a daughter”. The mother is told to forget she has a son. 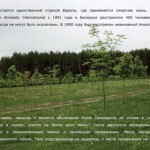 One is supposed to forget that there is a right to live if you live in Belarus. What are these show trials for? First of all, they are to scare the people of Belarus. 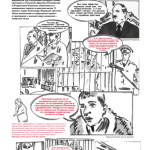 The aim is to show the Belarusian men, that the state has a power over them, the power to sentence them to death. In Belarus women are never put on death penalty by law. They are targeted as mothers and brought in a situation where they are left helpless, frightened and desperate. They have to beg for the lives of their sons. Even after the conviction, Ljudmila Kovaljewa does not voice any criticism of the government. She knows that there is only one single person in the world with the power to decide over her son’s life. 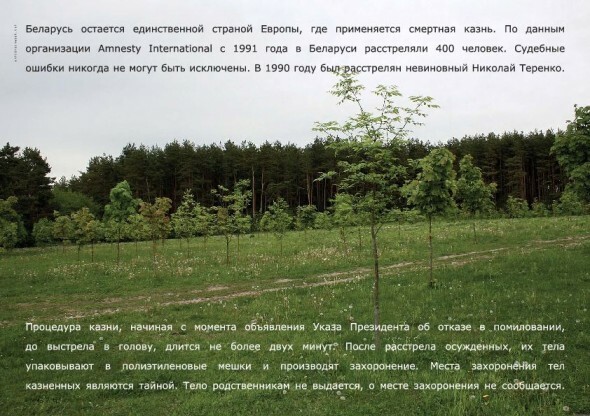 There is a slight chance that Lukashenko will pardon her son. The Belarusian people want to voice their opinion about death penalty, even though they know that their protest is worth nothing in the eyes of the government, and that they might be severely punished by this government. 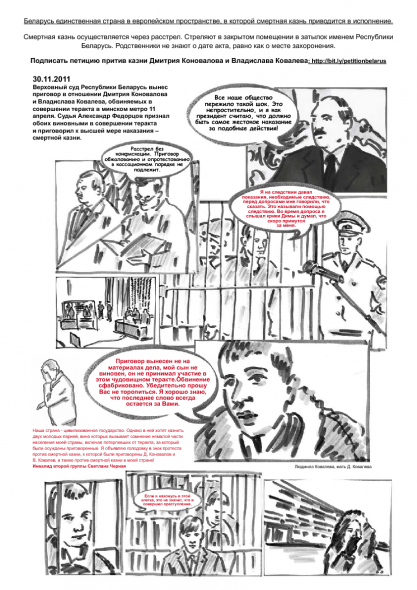 For how long will the democratization of Belarusian society be judged from the actions of the government? The Belarusian people have not elected this government, elections held a mere decorative function. For years now, international politics aims to democratize the Belarusian government. Does this not go against the general principles of democracy? And is this kind of commitment not looking for something at a spot where it by definition just cannot be? Everyone who raises the question why the people of Belarus do not rise up against Lukashenko has to face the counter question, how they themselves would act under these conditions, with their own lifes threatened. So are the small attempts of protest in Belarus a sign that this society is not ready for democracy yet? Or isn’t Belarus under present conditions rather a country of heros?